There’s no doubt about it, Callaway struck a sweetspot with the launch of the Epic line, and we’ve certainly had very warm words of praise for the Great Big Bertha Epic Driver in the past. So it wasn’t too much of a surprise when the announcement came last week that this particular collection would be expanding to cover both irons and hybrids. But, whatever we lacked in surprise, we make up for in excitement and anticipation! We now know that the Callaway Golf Epic hybrid will see the light of day on June 9, whilst the Epic and Epic Pro irons will be available a week later. Naturally, you’ll have to wait until a later date before we can get our hands on them and conduct our own independent review. But there are a few interesting features, technologies and insights that we thought we’d flag in the meantime. The launch of these majestic, slightly cushy irons confirms Callaway’s noticeable shift in direction, as they look to park their tanks firmly on the lawns of the luxury, or at least semi-luxury markets. Both the Epic and Epic Pros make use of so-called Jailbreak technology. This follows the lead of the drivers and fairway woods within the realm of the Epic line, whereby a steel cage-like structure is maintained as the foundation for the clubs, and a pair of titanium bars in the rear link the topline and the sole. The science behind it is that a stiffer Exo-Cage body enhances face flex at the point of impact, which in turn gives ball speeds a boost. Callaway have also put additional emphasis on ball speeds by virtue of thinner materials between the Face Cup 360 and the sole, which, in particular, they claim will improve forgiveness on strikes lower down the club. The hosel has also been hollowed out, which has allowed them to bulk up the Internal Standing Wave technology, with the CG able to be manipulated by an injection of steel-tungsten alloy into the chosen mold (and which is then welded in the head). Huge amounts of mass are concentrated within the plug of each iron too (roughly a third), while the CG shifts between long and short irons (lower for long irons, and vice versa). The Epic irons are unashamedly game improvement-focused, with COR readings for the longer irons which reportedly test the limits imposed by the USGA. The Epic Pros, meanwhile, are easily distinguished from its more user-friendly brother by virtue of less offset and loft, coupled with a slender, stylish look. At 250 bucks per iron, well… all we can say is this: they better be good! Will they be worth the outlay? Only time – and a no-doubt enjoyable testing session for ourselves – will tell. In terms of technology, the hybrids piggy back off the woods. With triaxial carbon used to reduce the weight of the crown in turn enables the use of discretionary weighting. Ball speeds are taken care of by the familiar 455 Hyper Speed Face Cup technology. It is interesting to note that there is some convergence with iron technologies, with the injection-molded Standing Wave plugs adopted in order to shift the CG downwards. 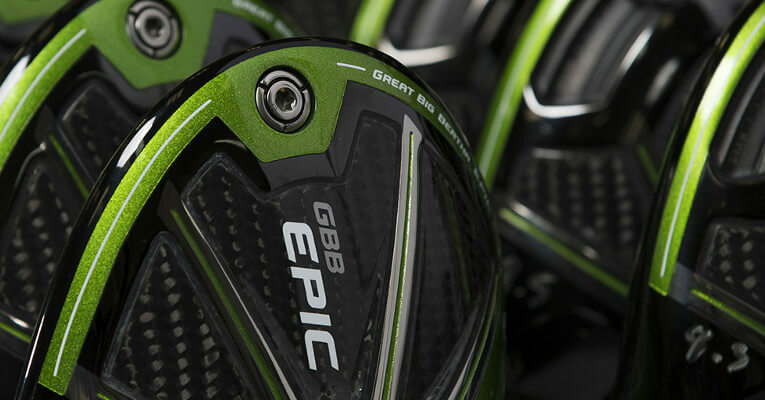 The Epic hybrids are coming in 18, 20, 23 and 26-degree variations. Again, at $280 a pop, we’d be loathed to use the word ‘bargain’ to describe the price tag, although compared to the irons, it isn’t quite as hefty in a relative sense. Nevertheless, it is fascinating to see Callaway make the decision to leverage the success of the Epic brand from the bigger guns into hybrids and irons, and, at first glance, they look the part.